Amazing music to listen to! It literally soothes the soul! Be gently immersed into the sweet soulful music that is SACRED. Beautiful, peaceful hymns and songs that stir the heart. Niki Vasilakis - blessed to be a blessing. Beautiful and gentle, 'Sacred' breathes new life into some of our most treasured hymns. It has brought comfort to a friend battling serious illness and peace to my young daughter struggling with bedtime fears - playing this CD really changes the atmosphere in a room. 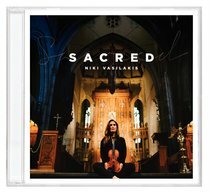 Even if you're not normally a fan of classical music, I believe 'Sacred' will really bless you, and is a wonderful gift to someone needing encouragement. A beautiful selection of reflective and meditative violin and piano music played by 2 very professional Australian musicians. Perfect for quiet background music. Absolutely beautiful and Inspirational music. Brings healing to the soul and is sweet to the ear.